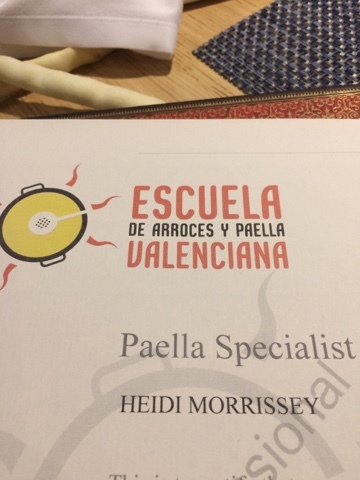 Today will also be know as the day when Heidi Morrissey became an official Valencian Paella Specialist! What a fun adventure we had today. 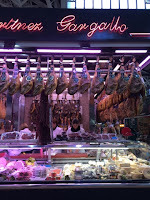 First, we walked to the central market of Valencia which is the largest fresh food market in Europe. 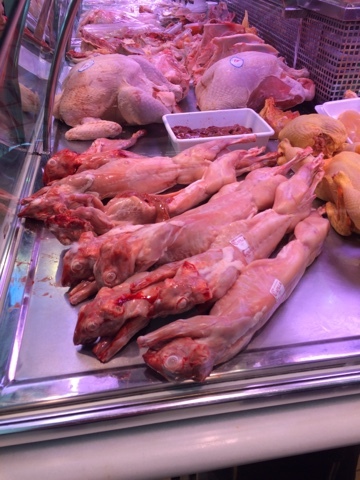 It is a surprisingly clean, airy place where a person can purchase anything imaginable to make a great meal. 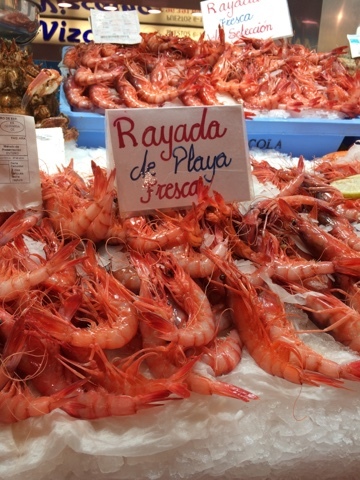 The seafood stalls alone are worth the trip! 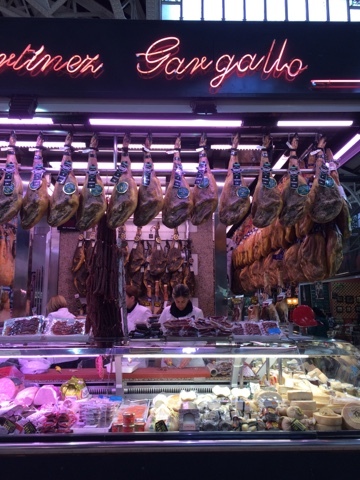 We met our instructor from the Escuela de Arroces (school of rice) who led us through the market to purchase our ingredients for our Valencian paella. 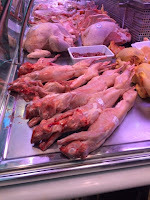 She explained the many different varieties of beans and spices. 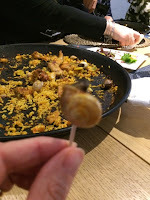 Paella in Valencia (the only truly authentic paella in the world) uses rabbit and chicken meat with snails added at the end. There are no onions or garlic in this dish at all. 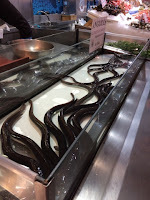 It requires a special low round pan and takes about two hours from start to finish! In groups of 3-4, we painstakingly chopped vegetables, turned meat and added ingredients as instructed by our instructor, Chef Jaime. He was fun, but very serious about his paella. I was scolded more than once for my mistakes. It was a little intense at times. I wasn’t sure I would get my certificate at the end of the training! 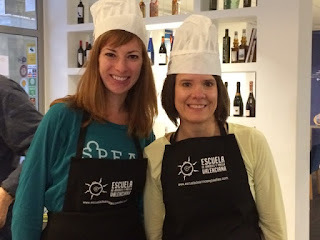 While the broth was boiling (no canned broth here), we enjoyed some tomatoes, Spanish omelet, mussels and more wine. 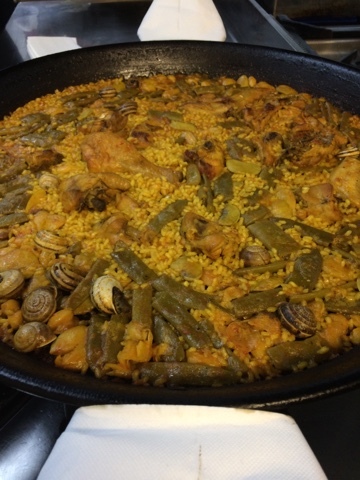 When the paella was ready, we posed for some photos and then began to dig in. Apparently, it’s customary to eat straight from the pan. We were served a salad with olives and tomatoes along side our paella. It was delicious, but very dense. In order to make sure that all of us were qualified to receive our certification, we had to try each other’s paellas. By the time lunch was over (at 4pm), we were stuffed and ready for a nap! 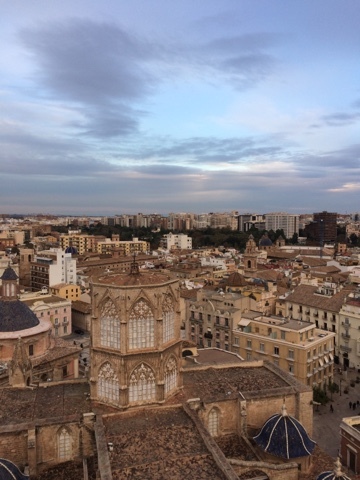 Mandy and I hung at the hotel for a few minutes and then decided to visit the tower of the Valencian cathedral. 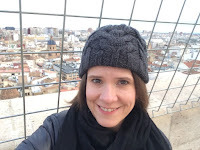 We walked the 200 steps to the top (we needed that!) 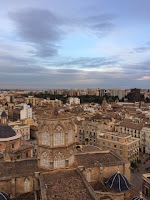 and enjoyed the panoramic views of Valencia from the observation area. We happened to be there when the 5 o’clock bells rang which was really cool. 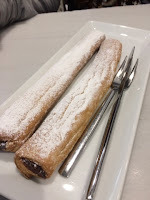 After that, we stopped for some fartons (Valencian-type churros) and some coffee. Then, we bought some chocolate at Valor. It was yummy! 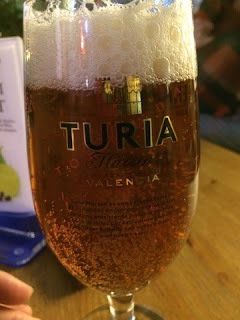 We walked around the main parts of Valencia for about an hour and then headed to the Mercado Colon again to try the other Valencian beer, Turia. I didn’t like it as much as the Socarrada from yesterday. 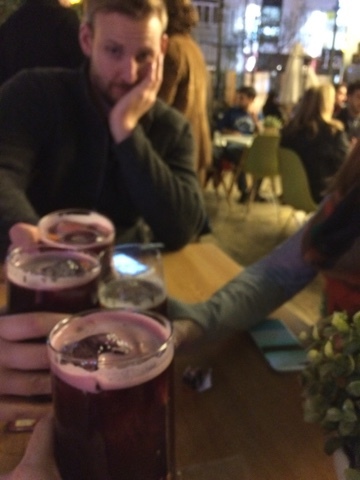 I also tried the sangria which was supposed to be the most refreshing in the world. Not so sure about that. We picked up some cheese and crackers at the grocery and headed back to the hotel to rest up for our Zurich adventure tomorrow. ← Thursday: Happy Thanksgiving from Spain!